Ciracle is a skincare brand that cares about the skin from its past to present, and even further to the future. It is a vitamin focused product that effectively stabilizes the unstable nature of vitamin through the use of high technology. By going through a strict selection of fix propertied components, its effect and safeness is outstanding, and is made of highly intensified resources that help improve the skin. 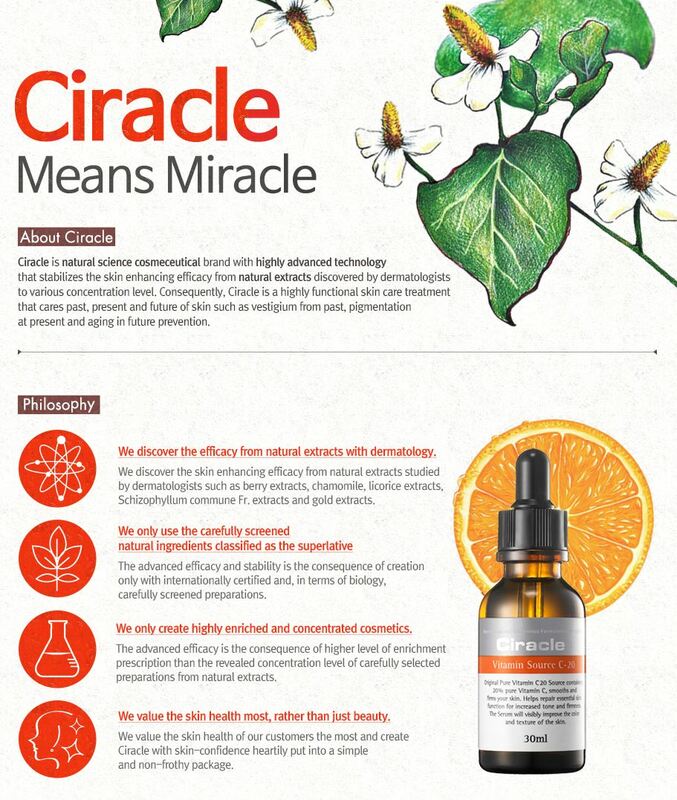 Ciracle is a professional vitamin C line products brand owned by the Cotde Bio-Research Center (CBRC), mainly focused on anti-aging and anti-wrinkling. The efficacy and its technology of the skincare products that are produced from the CBRC’s research technology are highly appreciated; they are chosen as their prescribed cosmetics from over 200 local dermatological hospitals.